This month for our Children's Classics carnival over at 5 Minutes for Books, we're talking about our favorite classics that we've recently re-read. 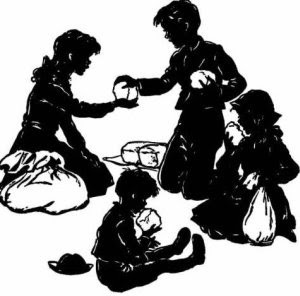 I chose to re-read the Boxcar Children which I have been slowly collecting for our children at our local Goodwill. I've managed to find most copies for $0.49 or $0.99 so I'm building this series fairly cheaply! When I was growing up, my best friend and I frequently made a habit of pretending and playing like we lived in boxcars or were out making our own way in the world and I was curious to see if these books would still be appealing to me "after all of these long, long years." Gladly, I can report to you that these books hold even more appeal for me now (if that is possible) than they did back then. Maybe I just realize how much more difficult it is to find clean and imaginative, fun literature for children these days, I dunno! 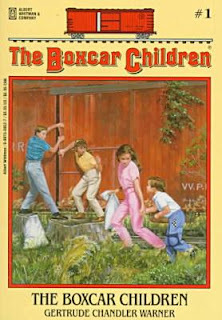 If you are unfamiliar with the Boxcar children, it is the story of four orphans who we meet up with as they are running away from all that they have ever known because they are afraid that they will be turned over to their stern and mean ol' grandfather. They find an old boxcar to live in while the oldest boy, Henry, finds a variety of yard work to do for a kindly doctor in the town. You might wonder how it is that four children living alone in the woods (and in an abandoned boxcar!) might have escaped the notice of many of the adults in the story. The kindly doctor was aware of their living conditions and kept a secret, to see how the children would fare. However, when young Violet becomes sick, the doctor quickly steps in and the children discover a grandfather that is not so much the mean ogre as he is the kind and benevolent - and loving! - grandfather that they've always wanted. It all ends well. The books were originally penned by Gertrude Chandler Warner who was a school teacher. She was having trouble finding quality reading material that would interest her students and so she wrote the first book in the Boxcar Children. It was welcomed into the world of literature with much enthusiasm, so that Warner went on to write an additional 18 books. There are countless numbers of books in this series today, but Warner only wrote the original 19. The rest were penned by various others. 1. She was called in to teach first grade during World War I, when most of the men were being called on to fight for their country and women were needed to move into employed positions outside of the home. She was a teacher, despite (ironically) the fact that she became too ill to complete high school and took a private tutor to complete her education. 2. She came from a very musically talented family. Warner herself played the cello. 3. Her first story was called, "Gollywog at the Zoo." She wrote it at age 9. 4. She was a volunteer for the American Red Cross. 5. There is now a Boxcar Museum in her honor. It is located in Putnam, CT.
After reading the first book in the story and remembering my delight of it, I went on to read the next two titles as well: Surprise Island and The Yellow House Mystery. Both were a delight and I literally had to stop myself from continuing to read on further. Someday I look forward to going back and rereading the first nineteen books in the series with my own kids. For now, I am just affirming that they are still just as charming and imaginative as they ever were and yes, I love them. This is another series I've never read, but I have a distinct impression of it being a favorite of a 5th grade teacher I had. Thanks, Carrie, for a great review! I'm in the process of reading these again--only this time I'm reading some volumes I missed as a kid. They are indeed a worthwhile series. I never read these as a kid, but Amanda was WAY into them -- probably around 2nd/3rd grade? At her bidding we did the first one as a read-aloud, and I agree that they are great. We have a LOT of them, that I also bought mostly at Goodwill! And though there are far more than 19 now, those are the good ones. Even Amanda noticed the difference in the newer ones. Kyle gets first dibs, but before I get rid of them (years down the line), I'll see if you need any for your collection. I love your background info on this series! I need to go back and try these books again. I don't know what's wrong with me but I could not get into them. My boys could really get into them I'm sure. I did a review of this series ages ago (too lazy to look for it and link now). At that time I read the first aloud to Will. I found the vocabulary and story and bit too simplistic. BUT. Now that Will (6 years) is reading independently I think these are great. The story is just enough mystery to interest him without causing bad dreams. The vocabulary is challenging enough that I think he's learning but not so much to frustrate him. I never read these and honestly knew zero about them, but Putnam, CT is quite close to where my parents live (and I did for 6 years!) Maybe we'll have to read some of these and check out the museum next year when we visit them for our summer trip! I had never read these growing but my husband had! We've started reading them to our son and we are all loving them! One of my goals in life is to have a complete set (1-19) in hardback for my kids to enjoy. While the titles by other authors are fun, they are formulaic and mere copies of Warner's work. Enjoyed your post! I gave book 1 recently to a girl who loved Betsy-Tacy! Must check back to see how she liked it.